Dr. Alex Spyropoulos (“Dr. Spy”) is a Professor of Medicine at the Hofstra Northwell School of Medicine as well as System Director of Anticoagulation and Clinical Thrombosis Services for the multi-hospital Northwell Health System. In addition, Dr. Spy is a Professor of the Merinoff Center for Patient-Oriented Research as part of the Feinstein Institute for Medical Research. He received his MD from the University of Pennsylvania School of Medicine, and he completed his internship and residency in internal medicine at the University of New Mexico Health Sciences Center. Dr. Spy is a recipient of the Lovelace Clinic Foundation Excellence in Education Award, as well as a Fellow of the American College of Physicians, the American College of Chest Physicians, the International Academy of Clinical and Applied Thrombosis/Haemostasis, and the Royal College of Physicians in Canada. In this interview, he speaks with us about his life and science. Dr. Spy loves spending time with his wife and his young kids. Lately, they’ve been enjoying apple picking, hay rides, pumpkin carving, and apple carving. His other hobbies include sailing, snowboarding and mountain biking. As a thrombologist, Dr. Spy studies blood clots. Many people worldwide are either at risk for blood clots or have existing clots. He focuses on venous thromboembolism primarily in the lungs and legs. These blood clots could cause morbidity or mortality, and many people are not familiar with the risks, common symptoms, or the situations in which clots may occur. “Science is built of facts the way a house is built of bricks: but an accumulation of facts is no more science than a pile of bricks is a house.” – Henri Poincare. Since his father was a well-known interventional radiologist, Dr. Spy was introduced to science and medicine early in life. His father was a pioneer in his field, and he was the one who originally got Dr. Spy interested in science and medicine. Medicine and biological sciences came easily to Dr. Spy, and he gained a strong background in science and research during medical school at the University of Pennsylvania. Getting patients involved in clinical trials is a challenge. You have to clearly tell a patient about the clinical trial, discuss the risks and benefits, and get them to really understand the importance of the trial. Establishing a sense of trust is critical, and it is also really important for patients to understand why you are conducting the trial. Bringing in stories from his own previous experiences with patients has been helpful. Another challenge is raising awareness of thrombosis in patients and the public. Thrombosis is the third most common cardiovascular disease globally, but most people don’t know much about it. It is important for people to be familiar with risk factors for blood clots, the signs and symptoms, and the potential fatality of blood clots. Establishing a robust thrombosis center at the Lovelace Medical Center in Albuquerque, New Mexico was a meaningful success for Dr. Spy. They were pioneers in establishing one of the first outpatient deep vein thrombosis treatment clinics there about 20 years ago. The Center began with a modest 300 patients and was up to about 4,000 patients when Dr. Spy moved to his next position. As far as clinical trials, Dr. Spy was honored to be on the steering committee of the BRIDGE trial which was published in the prestigious New England Journal of Medicine. Their findings supported simplifying the way patients who are prescribed warfarin are managed before, during, and after surgery. This had a big impact on medical practice in the field. Dry Spy’s favorite place to visit is his home country of Greece. Being an investigator in the global MARINER clinical trial, as well as having many Greek colleagues in cardiovascular medicine, provides Dr. Spy with many opportunities to travel there. He was born in Greece and still feels very connected to the country. It has gorgeous natural landscapes, and the ocean is beautiful. If you’re ever visiting Greece, be sure not to miss the new Parthenon Museum in Athens and the breathtaking island of Santorini. Dr. Spy has shared many fun and funny memories with his colleagues. On one occasion, he and a colleague were traveling to Mexico to go mountain biking in Copper Canyon. During the long drive, they started discussing the mechanisms of the biological cascade involved in the process of coagulation where liquid blood forms solid clots. The conversation quickly became three dimensional with wild hand movements and complicated gestures. Dr. Spy tends to talk with his hands a lot, so it was difficult to keep one hand on the wheel throughout this lively conversation. Understand your risk of getting blood clots. Assess your risk factors, be familiar with the symptoms of blood clots, and be aware of the situations that may increase your risk for blood clots. It is an exciting time to be in the field of thrombosis research because they can now start more precisely identifying the patients who are at high risk, and they have many more treatment tools at their disposal. Researchers are beginning to be able to deliver more patient-specific management strategies for this disease. Dr. Spyropoulos is a member of the global steering committee that is raising awareness for World Thrombosis Day. He is Section Editor for Thrombosis and Haemostasis, and is on the editorial staff for Thrombosis Research and Hospital Medicine. Dr. Spyropoulos has published over 160 research studies, articles, and editorials in peer-reviewed journals. 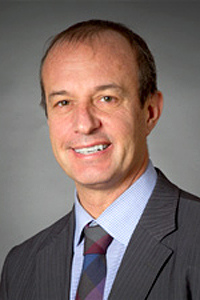 Among Dr. Spy’s research accomplishments, he has helped develop protocols using low molecular weight heparin in outpatient-based treatment of venous thromboembolic disease, patient self-testing of warfarin, perioperative “bridging” for patients on chronic anticoagulation, medical inpatient prophylaxis, protocols with regards to the use of anticoagulants for HIT, and clinical use of new anticoagulants and in select patient populations. Presently, he is conducting active research to analyze the outcomes of these medical protocols, and Dr. Spy has presented nationally and internationally on these topics. He was the Founder and former Medical Director of the Clinical Thrombosis Center in Albuquerque, New Mexico, and he has made key contributions to developing the clinical thrombosis curriculum at the University of New Mexico Health Sciences Center.